The journey: The “Retour des Indes” casks set sail from Douarnenez in Brittany then, after travelling down along the Spanish coast, they made a first stop off at Lisbon in Portugal. They continued along their way as far as Cape Verde and set off to take the Atlantic Ocean by storm. After a short stopover at Bélem in Brazil, they sailed back up to the Caribbean with a stop at Barbados and in the Dominican Republic. They left the warm waters to head for the Azores and then Falmouth in the United Kingdom. The journey could have ended there but, keen to explore the world, the wines sailed back up the North Sea as far as Amsterdam and Copenhagen. Having had their fill of sea air and gorgeous landscapes they finally returned to Douarnenez. A year later “Retour des Îles” is available for the Christmas holidays. Tasting Note: Only 1200 bottles produced, and matured on-board a brigatine sailing the Atlantic for one year, which is said to develop more distinctive flavours in the wine. Its robe is dark garnet and dense. 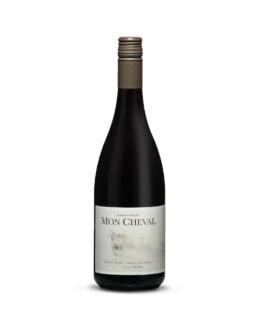 It has powerful aromas of very ripe red fruits. The mouth is remarkably well-balanced, round and full-bodied, long and full. It offers a fine expression of the fruit accompanied by supple, melted tannins. It is a harmonious and very expressive wine already, with wonderful potential for laying down.